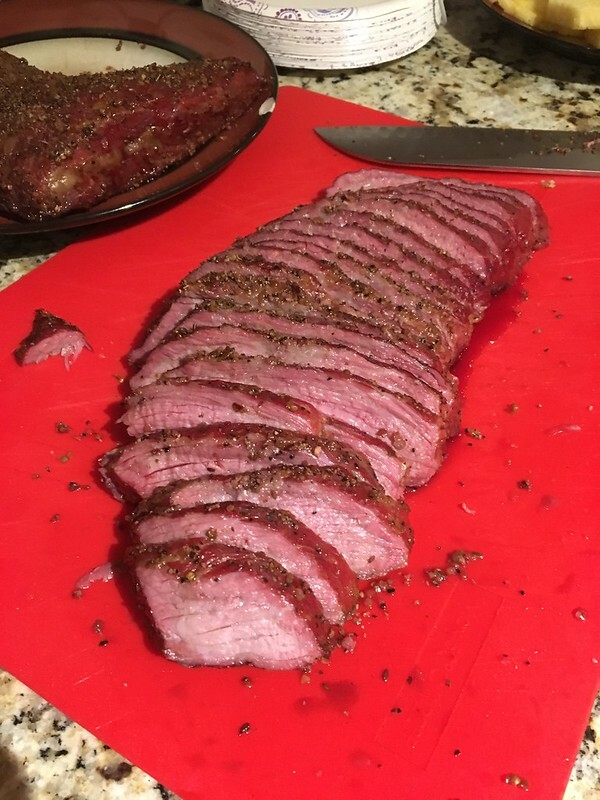 "Tri-tip steak is cut from a tri-tip roast, which is a small, triangular cut from the sirloin. The tri-tip was popularized in California but is now more widely marketed, although you may need to request it from your butcher. It is also known as a triangle steak or bottom sirloin steak"
Anyhow, here's how I cook it. Marinade your steak(s) in beer and a generous amount of monteral steak seasoning. I like to use a mild beer for this. Let the steak marinade from 4 to 12 hours. I lean more towards the 4 hour mark. Although I have let them go over night. Pull your steaks from the fridge about 30-45 minutes prior to cooking allowing them to come up to room temperature. Set your grill/smoker temp to 350* and preheat. Once ready place the steaks on the grill. If your using a charcoal grill use an indirect heat method. Allow the steaks to cool for about 2-3 hours. You want an internal temperature of 145* for medium rare. Pull the steak off the grill and let it rest for 20 minutes. Once rested cut into thin slices and serve. I really love to make sandwiches with this meat. Toast a roll, coat with mayo, and add the steak. We have tri-tip around here, it's just harder to find. We also have flank and skirt steaks which are also very tender. I love Tri Tip. I could eat that picture right there. I cook them like a brisket sometimes on low heat and oak for smoke. I usually get them up to 160 then wrap in butcher paper and put them in a styrofoam cooler to finish cooking. Low and slow baby. Reverse sear is good also. Smoke to about 130 then on a hot grill to sear. Man that looks good.